Update: Android Pie is now the new Android kid on the block, but some devices are still waiting on Oreo. Google's Android Oreo update is no longer the newest stable version of its mobile operating system, that honor now goes to Android Pie. But Android Oreo is far more widely available. That said, despite having been around for a while now, not all devices have Oreo yet and not in all regions of the world. Below, we've highlighted which smartphones have seen the Android Oreo update and, for others, the release date of when to expect it. Android 8.0 Oreo focuses primarily on speed and efficiency. Google's Pixel phones, for example, have seen boot times cut in half with Android 8.0 (another name for Oreo). Others are faster too, according to our testing. Pesky background activity that drains your battery and data plan have been restricted, another perk of Oreo. Android Oreo skimps on bold visual changes, but packs in useful design tweaks, like picture-in-picture (PiP) mode for multitasking with the likes of YouTube, Google Maps and Hangouts appearing in a small corner window when minimized. New notification dots on apps icons offer a colorful reminder to check out updates. Android Oreo 8.1 has launched on even fewer devices, but packs in extras, mostly concentrated on Pixel phones. AR Stickers on Pixel phones inject even more fun into the stock camera app as we demoed in our in-depth article. The Pixel 2-exclusive Visual Core makes the best phone camera even better with improve HDR+ photos. Head to the next page to read more about the best features coming with the Android Oreo update. But first, check out which phones are compatible with the software. When can I download Android Oreo? 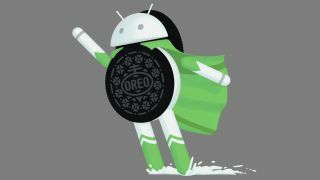 Oreo has landed on many handsets now. Most high-end and high-profile phones from the last couple of years now run it, while recent handsets in many cases shipped with it. The Essential Phone, was one of the first to get the update (and has also become one of the first to get Android Pie). If you own a Google Pixel 2, Google Pixel 2 XL, Google Pixel, Google Pixel XL, Pixel C, Nexus 6P or Nexus 5X you should also have been among the first to get Oreo, and in fact, you'll be able to update to Android 8.1 now as well, or - if you're on a Pixel - even jump to Android Pie. But the likes of the Samsung Galaxy S8, Samsung Galaxy S8 Plus, Samsung Galaxy Note 8, LG G6, LG V30, Nokia 8 and more all now run Oreo too. The jump to 8.1 is not a big update, but it's set to improve performance on devices with 1GB of RAM or less as well as adding a new Neural Networks API to accelerate on-device machine intelligence. If you're using a Pixel 2 it should also improve the quality of HDR photography. Not seeing your current phone, or the one that's on your wishlist? Don't fret just yet, this is only a subset of the devices with Oreo - you can get a closer look at key manufacturer updates below. And if your phone doesn't have Oreo yet you still might not be out of luck, as Google itself has confirmed that the Oreo update will hit more devices as the year rolls on. The Samsung Galaxy S8 and S8 Plus have been updated to Android Oreo on most carriers around the world. Android Oreo's update on the Samsung Galaxy Note 8 is also now widely available. In addition to getting the latest version of Android, these phones are receiving Samsung Experience 9.0 (formerly TouchWiz) with even more software tweaks. Most versions of the Samsung Galaxy S7 and Samsung Galaxy S7 Edge should now also have Oreo, while the Galaxy S8 Active has it on AT&T and T-Mobile in the US, and the Galaxy S7 Active has it on AT&T. Meanwhile in tablet land, the Samsung Galaxy Tab S3 should have Android Oreo available in both the UK and the US. Looking ahead, we know from Samsung's roadmap (above) that many low-end and mid-range phones will be getting Android Oreo in either late 2018 or early 2019. These include the Samsung Galaxy J7 (2017), the Samsung Galaxy On7 (2018), the Samsung Galaxy C9 Pro and many others. The Nokia 6 (2017), Nokia 6.1 (2018), Nokia 5, Nokia 3 and Nokia 8 all now have Oreo and some of them are even rocking Android 8.1. The Nokia 2 meanwhile currently has the software in beta, so expect a stable build to land before too long. Of course, many of the more recent Nokia phones, such as the Nokia 8 Sirocco, ran Oreo out of the box. HTC's 2017 flagship, the HTC U11, now has Android Oreo. Most models of the HTC 10 (including Sprint, Verizon and unlocked versions) should now have Oreo too. HTC has confirmed the HTC U Ultra will also get the software at some stage, but exact timings for the update are currently unclear. The HTC U11 Plus and HTC U11 Life both featured the software at launch, as, of course, did the HTC U12 Plus. Android Oreo is now available for the OnePlus 5T, OnePlus 5, OnePlus 3T and OnePlus 3. And, of course, the new OnePlus 6 launched with Android Oreo in tow. The new Sony Xperia XZ1 and Sony Xperia XZ1 Compact both run Android Oreo out of the box. Concerning the company's back catalog, it's already hard at work bringing things up to speed. You'll see Oreo land on the following devices: Sony Xperia X, Sony Xperia X Performance, Sony Xperia XZ, Sony Xperia X Compact, Sony Xperia XZ Premium (available now), Sony Xperia XZs, (available now) Sony Xperia XA1, Sony Xperia XA1 Ultra and Sony Xperia XA1 Plus. International unlocked versions of some of these handsets already have Oreo. Have a Moto phone? The company stated a while back that it will start rolling out the update to the following phones: Moto Z, Moto Z Force, Moto Z2 Force, Moto Z Play, Moto Z2 Play, Moto G5, Moto G5S, Moto G5 Plus, Moto G5S Plus, Moto X4 and Moto G4 Plus. Many of these handsets now have Oreo on select US networks. Previously, the company had promised to update the Moto G4 Plus to Android Oreo software, but made no mention of that handset - or the Moto G4 - in its announcement. While Moto has done right by changing its tune and adding support for the plus-sized budget G4, it appears that the regular G4, as well as the Moto G4 Play, will sit this one out. Note: the Moto G6 and Moto G6 Plus both come with Android Oreo immediately. LG launched the LG G7 ThinQ with Android 8.0 Oreo working out of the box. As for older handsets, your LG V30 or LG V30+ should have Oreo now. The LG G6 should also now have Android Oreo, and even the LG G5, LG Q6 and LG V20 are in line for the long-awaited update. It's all later than we would have liked, but LG says it'll get better at rolling out future Android updates. Many of Huawei's biggest phones now have Oreo, including the Huawei P10, Huawei P10 Plus and Huawei Mate 9 - though not necessarily in all regions or on all networks. More recent flagships such as the Huawei P20 and Huawei Mate 10 of course launched with Android Oreo. As for sub-brand Honor, the Honor 9 and Honor 8 Pro should both now have Oreo in the UK, while the Honor 7X reportedly has it in Europe and the US. After skipping on the vanilla Android Oreo release, the PH-1 now supports Android Oreo 8.1. It's available now, no matter which carrier you use the Essential Phone on. In fact, you can even now get Android Pie.